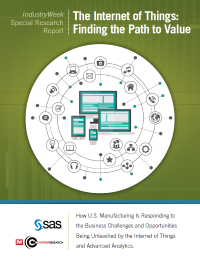 Download this IndustryWeek report, which explores the state of IoT technology planning and adoption and looks at the analytical capabilities of manufacturers, and what some industrial businesses leaders are doing to outpace their competitors when it comes to the use of analytics. The number of network-connected devices today is staggering, and estimates are it could triple to 21 billion by 2020. This big data, already old news for many manufacturers, is changing the way they make business decisions and providing new and exciting ways to leverage the Internet of Things to find success. Manufacturers have always had a wealth of data at their fingertips, long before the terms “big data” and the “IoT” became coined, and yet many remain reactive and are missing huge competitive opportunities, according to the 2015 IndustryWeek Industrial Internet of Things Analytics Research Study.